Supporters of the Deferred Action for Childhood Arrivals (DACA) program rally on Olivera Street in Los Angeles, California, September 5, 2017. Wal-Mart Stores Inc, Target Corp and PepsiCo Inc on Wednesday joined an expanded group of nearly 800 companies calling in a letter for U.S. legislation to protect immigrants brought into the country illegally by their parents from deportation, according to organizer FWD.us. The retailers and other companies asking Congress to pass a permanent replacement for Deferred Action for Childhood Arrivals, or DACA, reflect broadening pressure on political leaders to find a solution for the roughly 800,000 immigrants known as “Dreamers”. A group of businesses less than half the size and weighted toward technology companies sent a similar letter in August, before President Donald Trump said he would end the program. The new letter reflects Trump’s decision and asks for a permanent solution to let DACA recipients remain in the United States. Trump said that DACA immigrants who have work permits that expire before March can apply to renew them for another two years, if they do so before Oct. 5. Both letters were spearheaded by FWD.us, a pro-immigration group co-founded by Facebook Inc Chief Executive Mark Zuckerberg. The very first incarnation of the letter included signatories from major technology companies such as Apple Inc, Microsoft Corp and Amazon.com and Alphabet Inc’s Google. But over the course of several days, a much broader swath of the U.S. economy, from media firm Viacom to private equity firm TPG signed on. The newer letter adds firms like biotech firm Becton, Dickinson and Co, according to a copy of the letter and signatures seen by Reuters. 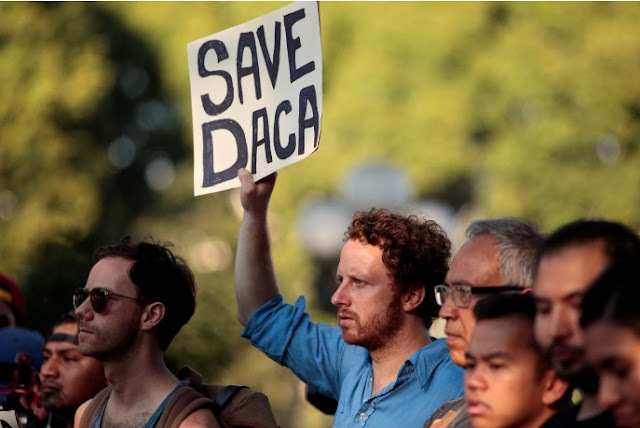 “That you see business leaders from every major sector of the economy come out and ask Congress to pass a permanent fix for DACA right away shows that this is a bipartisan issue that has strong support,” Todd Schulte, president of FWD.us, told Reuters. The DREAM Act, first introduced in Congress in 2001, would provide Dreamers with a way to become U.S. citizens after first becoming permanent residents. DACA, a set of executive actions introduced by President Barack Obama in 2012, didn’t include a pathway to citizenship, which would require an act of Congress. Some conservatives in particular object to offering citizenship to DACA recipients. Activists including United We Dream also are encouraging DACA recipients and companies they work for to be public about their situation. Enrique Ramirez was brought to the United States from Mexico when he was two years old. He graduated from Harvard University and is now attending law school at the University of Texas at Austin. “There’s been so much money invested in me by this country, wouldn’t even a conservative person want me to contribute to my community here?” Ramirez said. DACA shields recipients from deportation and allowed them to work and attend school legally if certain requirements were met. Speaking on ABC television on Sept. 19, Apple CEO Tim Cook said he was “encouraged” that leading Democrats and Republican President Trump have said they are near a deal on DACA legislation. Apple has said it has 250 DACA beneficiaries among its ranks. Other tech companies are looking to pair with local groups to help DACA recipients. Ride-haling firm Uber Technologies Inc [UBER.UL] said that is holding a series of town-hall meetings in 10 cities to answer drivers’ questions about DACA changes, and that it plans to donate $500,000 to local groups that can help drivers with issues like paperwork and application fees.